Extra fees, oversold tickets, flight delays and cancellations helped to make Spirit Airlines the most complained about airline in the U.S., according to a report this week. Spirit (SAVE) received the most complaints per passenger last year, the U.S. PIRG Education Fund found. The group examined complaints made to the Department of Transportation about major U.S. airlines. 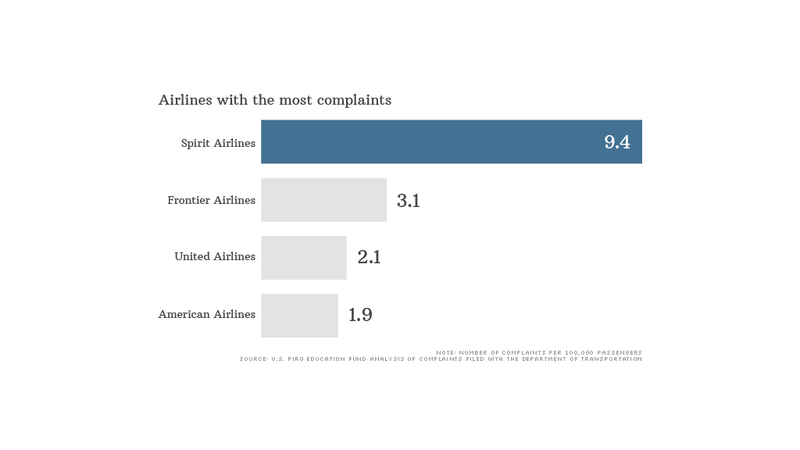 Passengers of Spirit were three times as likely in 2013 to lodge a complaint than those flying on Frontier Airlines, which received the second largest number of complaints per passenger. United Airlines (UAL) and American Airlines (AAL) took the third and fourth spots. Spirit's fees have been a source of frustration for fliers, said Paul Hudson, president of Flyersrights.org. Spirit says it is able to offer discounted fares because it lets passengers choose whether or not they want to buy meals or pay to check in their luggage. "Many of the DoT complaints are driven by customers not fully understanding that we offer unbundled fares that let them control how much they spend," said Maggie Espin-Christina, a spokeswoman for the airline. A spokeswoman for Frontier Airlines, Kate O'Malley, attributed its elevated complaint level to a one-off event, a program aimed at converting its frequent flier miles to Delta's SkyMiles. Almost 40% of last year's complaints involved the program, she said. United Airlines, which did better in the PIRG analysis than it did the previous year, said it is "investing significantly" to improve its services and was "pleased to see the latest rankings reflect our progress." 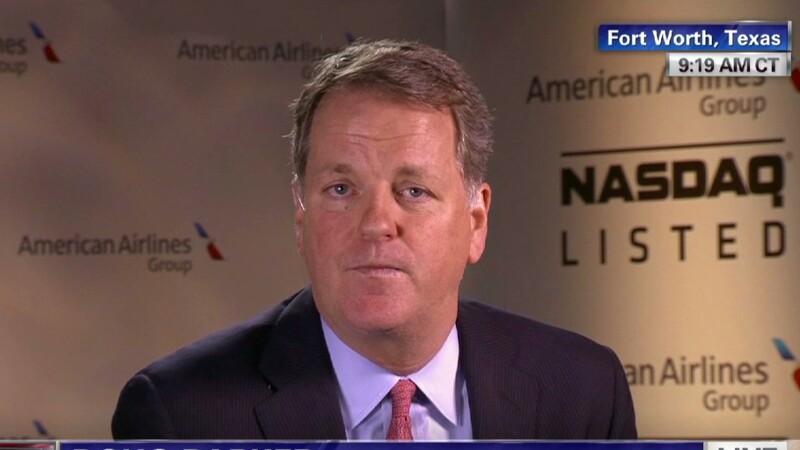 Matt Miller, speaking for American Airlines, noted that the airline faced tough weather conditions early and late in 2013, particularly in Chicago, one of its main hubs. Southwest (LUV) had the best record, with the smallest number of complaints per passenger, PIRG said. It is also the only major carrier to allow passengers to check two bags for free. Alaska Airlines (ALK), which is one of the most consistently on-time airlines, was also one of the least likely to elicit complaints from its passengers. Other airlines with few complaints per passenger included Delta (DAL), JetBlue (JBLU) and AirTran. Throughout the airline industry, however, passenger dissatisfaction is on the rise, PIRG found. Among the top complaints: flight delays and cancellations, overbooking, lost baggage, customer service, and mishaps with reservations and ticketing. While still prevalent, complaints about lost luggage and baggage handling are starting to decrease. PIRG attributed the decline to rising fees, which have prompted many travelers to try and avoid checking in their bags altogether. The fastest growing complaint category was flight delays and cancellations. On-time performance fell throughout the industry last year, which could explain the uptick, PIRG said. "Consumers are incredibly frustrated," said Laura Murray, a consumer associate for U.S. PIRG. "Flying isn't fun."